Contemporary style & functional design. Our contemporary designer portfolios are a great choice for style, function and enhancement of corporate image. Our custom packets can organize everything you need into a compact, organized and professional presentation. Click here to view our brochure. Easy to organize and with less wear & tear on contents (no hole punching). In addition to standard size documents, special size media like CDR's and DVD's are safely maintained (contents cannot spill). Our professional portfolios offer built in expansion (tyvek rip-proof gussets) for more capacity and immediate access to materials as needed. Integrate a set of custom divider inserts to help highlight sections and further organize contents of your corporate portfolio. Our designer portfolios are custom made to meet your specific needs. You may choose cover stock, colors and product dimensions to ensure that your design and corporate image is professionally presented. There are a multitude of custom printing and finishing options including full color process. Make a statement with Franklin Mills custom hospital employee porfolios! Make a statement with Franklin Mills custom orientation portfolios! 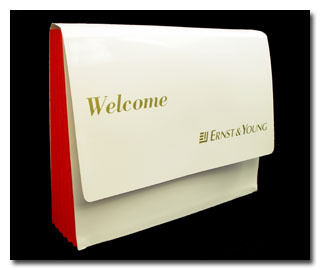 Make a statement with Franklin Mills custom-made welcome kits & portfolios! Make a statement with Franklin Mills custom law firm portfolios!